Kate Finn’s turtle baby toys are so soft and very cuddly. Keep your baby giggling with our squishy soft turtle baby toys that squeak when you squeeze them! Our little patchwork Turtle baby toys which are so easy for little ones to learn to grab and play! Kate Finn has been designing soft baby toys since 1978. Recognized in the marketplace for high quality and beautiful fabrics, giving a gift designed by Kate Finn no matter how small is giving a gift from the heart. Baby Toys by Kate Finn are designed to be soothing or stimulating and with safety in mind. Collections are created to enhance baby room decor. Select a variety of complimentary shapes to make your baby gift a gift with a difference! 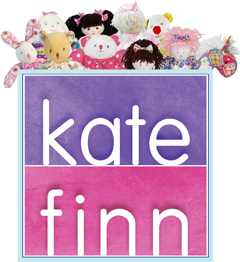 Kate Finn designs fabric themes so that Baby Toys match Rag Dolls and our stunning range of Golliwogs. Embroidered Felt Gift Tags – Kate Finn offers a variety of Gift Tags to commemorate important events such as First Birthday and First Christmas. Tie them to the wrist of a Doll or Golliwog or to your gift wrapping. Attach them to Party Favor Bags or hang them on Christmas Trees, as they are reusable the uses can be endless!